Freaks of Nature was once titled Kitchen Sink and after seeing it I realize why that title is so fitting. This movie literally has everything plus the kitchen sink, which makes for one of the funniest horror/comedies that I have seen since Tucker and Dale vs Evil. In a way this is a send-up of every stupid, watered-down-for-a-PG-13-rating movie that has come out over the past 10 years, yet it has its own story to tell that is both funny and, at times, fervent. 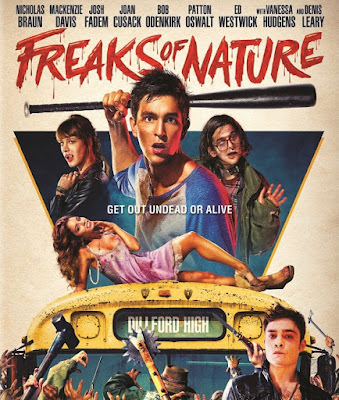 Freaks of Nature takes place in the small town of Dillford where, for unknown reasons, vampires, zombies and humans coexist in peace. But this delicate balance gets ripped apart when the alien apocalypse arrives and put an end to all the harmony. Now it's up to The Human Dag (Nicholas Braun), The Vampire Petra (Mackenzie Davis) and The Zombie Ned (Josh Fadem) to save the town of Dillford from the invading aliens and restore the town to its peaceful existence. Casting for the movie is outstanding, this is what they mean when they say there is no such thing as a small role. Everyone from Keegan-Michael Key (Key and Peele) to Patton Oswalt (Ratatouille) are perfect and contribute so much to the overall story, but Josh Fadem, Nicholas Braun and Mackenzie Davis shine the brightest amongst this sea of stars. These three approached the material head on and played it straight, when most would have hammed it up. The three deserve more credit than I can give them, because had they tilted one way or the other this would be your average horror/comedy cash grab movie. I would be remiss if I didn't mention the man behind this movie; Oren Uziel. Even with such a great cast you still need a good story to tell and that is what Uziel delivers. He tied together every classic genre type into one story, while sneaking in a sincere side plot to give our characters depth. It's like John Hughes and Wes Craven came together, combined their talents and made the craziest (in a good way) movie ever. Freaks of Nature is a movie that you can watch by yourself, with your girlfriend or a group of friends and you/they will have a genuinely fun time. It's off-the-wall insanity with a crazy plot that is just so out there it's amazing. If you don't rent or buy this, then you are missing out on some awesome fun.